With the new 3Doodler Start creative kids can finally bringall of their wonderful and imaginative ideas to life in 3D. The 3Doodler Start3D printing pen extrudes BPA free Plastic that cools and hardens rapidly,allowing kids to literally draw in the air. The 3Doodler Start is specially designed to be clean and safe for kids aged 6+,with no hot parts or messy resins or glues to contend with. It uses 3DoodlerStart Plastic that's completely biodegradable, non-toxic and BPA-free (andcomes in an array of vivid colours). 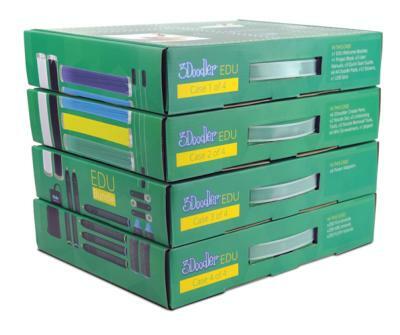 What’s included in each 3Doodler Start EDU bundle?